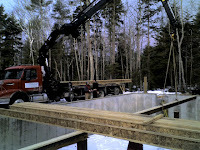 January 22 -- It is about 20 Degrees out and our crew has just started building the First Floor Platform of this 32x54 seaside timberframe home. The garage was constructed about two weeks ago and will be connected to the house with a breezeway. Here, our crew sets a steel I-Beam with our 95-ft boom crane. Check back for more photos as this project progresses! 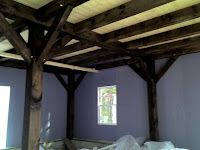 This is the interior shot of a 26X28 Timber Frame Garage, constructed the week of January 7th, 2008. The wood is Eastern White Pine stained a deep brown. The subfloor is 2x6 tongue and groove spruce decking and the walls are unfinished gypsum. Visit again for shots of the adjacent home under construction in the next few weeks! When Patsy and I founded the Shelter Institute in 1974, we had just built a house for a client at a quarter the then average price and the house had no harsh, questionable products. It was built of wood, glass, concrete, some steel and copper, fiberglass and our four hands. What could be simpler? The first passive solar home made the national media and the rest is history. The Oscar-nominated movie “Urge to build” documenting Shelter Institute students building everywhere, concluded with the words; “when we finished the house, we didn’t celebrate its wonder; it was just something that freed us.” More than ever, knowing structure, wiring, plumbing, vapor, heating and cooling, septic systems, and water supplies, truly lifetime roofing, how to successfully and enjoyably make calculations are the road to true freedom. Shelter grads are free because they avoid having to spend half a lifetime making high mortgage payments. And because they built a better house for less, their profits at moving time are much higher. Our culture today wanders far from the independent-minded “can do”, even love to-d0, caring and thoughtful lifestyles we witnessed in the sixties and seventies. Today we seem consumed with consumption. People couldn’t wait to discard their expensive PC Windows program every few months for the next version, and industry was very careful to mind our pathetic lust, hence billionaires. Shelter clients learn on the first meeting to spot these traps and laugh our way around them. While Shelter Grads built solar capes on the coasts and solar sheds in the deserts, most Americans built mega mansions of 13 gables that cost fortunes to design and build, caused enormous material waste and will prove to be not maintainable or saleable. The Shelter Institute Design Build class is the single most important learning experience you will ever have. Our graduates tell us so every day, whether they were here yesterday or thirty years ago. 2008 is about finding a president, whether the rest of the world will continue to finance our lifestyle, icecaps melting, and vast increases in cancer, heart disease and diabetes. Come join us in one of our classes and learn to build the most elegant, super-insulated, and functional home, knowing exactly where each penny will go. The common sense and competence we teach will free you, and those four big issues will take on a handleable perspective. We do it every day, you can too!